When you live in the UK keeping the elements at bay isn’t easy, but the Thompson’s range has been designed to do just that – helping you tackle the biggest jobs, whatever the weather. There isn’t much Thompson’s doesn’t know about weatherproofing. Drawing on more than 80 years experience to create long-lasting, easy-application solutions for expert DIY’ers and trade professionals. Whether it’s fixing a roof, sealing a driveway or eradicating stains from footpaths and drives, they’ve got some of the world’s toughest performance products that will restore, repair and keep the elements at bay. 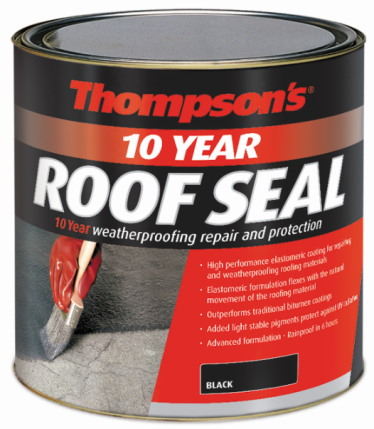 Thompson’s 10 Year Roof Seal takes the pain out of repairs and will protect against even the worst conditions. Rainproof in six hours, it won’t take forever to get the job done and it’ll protect against harmful UV rays. It’s stronger than traditional bitumen coatings, its unique formulation flexes with the roof too. Offering you ultimate piece of mind, knowing your roof will be protected for a whole decade. Thompson’s Water Seal and Thompson’s One Coat Water Seal are suitable for use on brick, stone, concrete and wood. The formula creates a long lasting barrier against rain damage – that’s effective after just one application. The results are extremely visible, with the water rolling off the substrate and creating a beading effect. Blasting dirty driveways just got easier too with Thompson’s Oil and Drive Cleaner. Used neat or diluted, this tough solution gets rid of stubborn oil, grease, petrol and diesel stains.